The Alaska Highway begins at Mile 0 in Dawson Creek, BC. 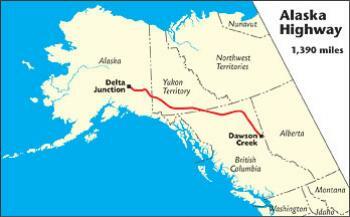 The first 613 miles/987 km of the Alaska Highway are in British Columbia, where it is designated BC Highway 97 North. The highway travels in a northwesterly direction to the Yukon border near Watson Lake, YT (Historical Mile 635). From there it continues as Yukon Highway 1, crossing 577 miles/929 km of Yukon to Port Alcan on the Alaska border. The Alaska Highway crosses into Alaska at Historical Mile 1221.8, where it becomes Alaska Route 2. 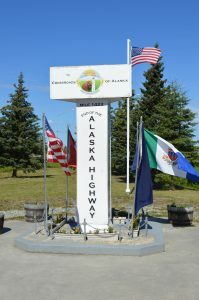 From this international border, it is 200 miles/322 km to Delta Junction, AK (Historical Mile 1422), the official end of the Alaska Highway, and 298 miles to Fairbanks, the unofficial end of the highway, at Historical Mile 1520. 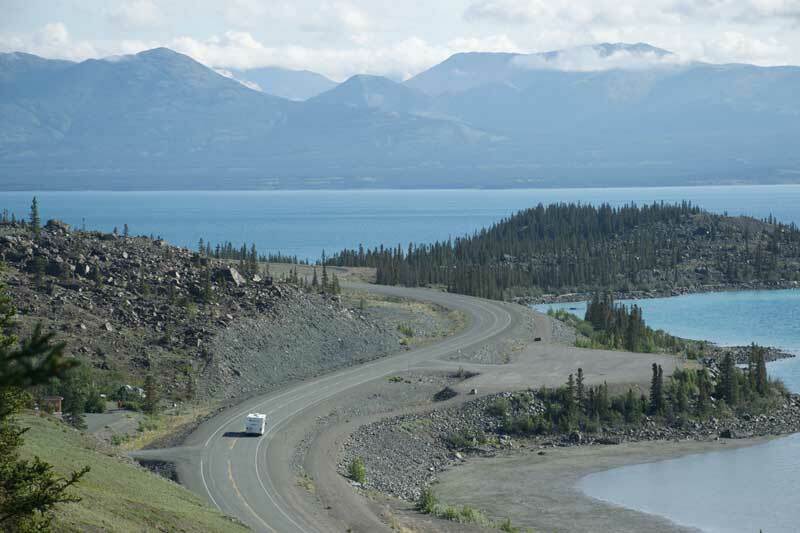 The Alaska Highway winds along the shore of Kluane Lake in Yukon Territory. All of the Alaska Highway is paved, although highway improvement projects often mean motorists have to drive a few miles of gravel road. The asphalt surfacing of the Alaska Highway ranges from poor to excellent. Much of the highway is in fair condition, with older patched pavement and a minimum of gravel breaks and chuckholes. Recently upgraded sections of road offer excellent surfacing. Relatively few stretches of road fall into the “poor” category, i.e. chuckholes, gravel breaks, deteriorated shoulders, bumps and frost heaves. That said, it is difficult to predict road conditions on the Alaska Highway. A hard winter or heavy rains can quickly undermine what was good roadbed, while road crews can just as quickly improve a previously substandard stretch of road. Highway businesses and other travelers are often helpful sources of information for current road conditions. Always inquire locally about what road conditions may be like up ahead of you and, in the off-season, what facilities are available, since many businesses operate seasonally. Miles from Dawson Creek (DC) shown. DC 0 Mile O in DAWSON CREEK (pop. 11,800); all services. Visitor information. Mile 0 Post (pictured to left) is downtown at 10th Street and 102nd Avenue. DC 1.5 Mile 0 Park; camping. Campground is adjacent Walter Wright Pioneer Village. DC 17.3 Exit east for loop road to Kiskatinaw Provincial Park (3 miles/5 km); camping. 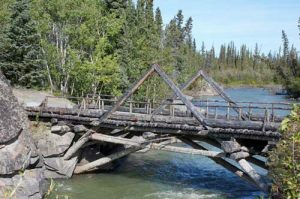 Also access to Historic Kiskatinaw River Bridge, the original Old Alaska Highway wooden bridge (pictured at right). DC 34.4 Peace River Bridge, longest water span on the Alaska Highway. DC 35 TAYLOR (pop. 1,300); food, gas, lodging, camping. Visitor information at the Visitor Centre on the Alaska Highway; stop and photograph the Gold Panner statue. World’s Invitational Gold Panning Championship in August. DC 47 FORT ST. JOHN (pop. 21.523); all services. 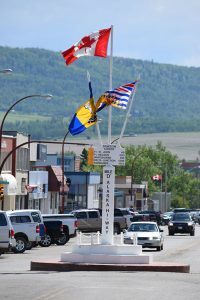 Food, gas and lodging are located on frontage roads along the Alaska Highway and in downtown Fort St. John. Visitor information is located inside the Pomeroy Sport Centre at 9324 96 Street. DC 51 Turnoff for Charlie Lake day-use area and campground. 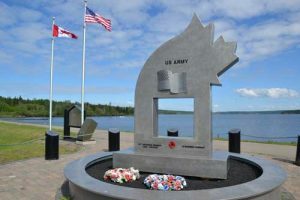 The Alaska Highway monument here (pictured at right), is a memorial to 12 American soldiers working on construction of the Alaska Highway who drowned here in 1942, when their pontoon boat sank while crossing the lake. Camping at adjacent Rotary Park campground. DC 53.6 Junction with Highway 29 to Hudson’s Hope to west. Turnoff to east for Charlie Lake Provincial Park; camping. DC 71.7 Historical Mile 72. The Shepherd’s Inn; restaurant (with homemade baked goods), motel, gas/diesel; phone 250-827-3676 or email. DC 101 WONOWON (pop. 150); food, gas. DC 140.4 Historical Mile 143. PINK MOUNTAIN (pop. 99); general store, gas, diesel, camping at Pink Mountain Campsite & RV Park, Race Trac Fuels, phone 250-772-5133 or email. DC 159.2 Historical Mile 162. SIKANNI CHIEF. Sikanni River Campground & RV Park; seasonal gas, lodging and camping. DC 173.3 Buckinghorse River Wayside Provincial Park, camping. DC 173.4 Historical Mile 175. Buckinghorse River Lodge to west; seasonal 24-hour public cardlock AFD gas pump. Camp complex to east is for gas-patch crews only when open. DC 265.5 Andy Bailey Regional Park 7 miles/12 km east; camping. DC 280 Ye Olde Quilt Shoppe has quilting supplies; phone 250-774-2773 or email. 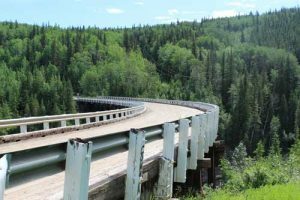 DC 281.2 Muskwa River bridge, lowest point on the Alaska Highway at elev. 1,000 feet/305m. DC 283 Historical Mile 300, FORT NELSON (pop. 6,147); all services. Lodging at Woodlands Inn & Suites and Ramada Limited (email); groceries and natural foods at Down to Earth Heath Shop; RV/vehicle servicing at Dalex Auto, Muskwa Service Ltd. and Al’s Car Clean & Repair (phone 250-774-4931). Visitor information.inside the Northern Rockies Regional Recreation Center, across the highway from the museum. DC 284 Triple “G” Hideaway RV Park; phone 250-774-2340 or email; full hook-up camping, laundry, restaurant (restaurant closes Sept. 30, campground remains open well into October). 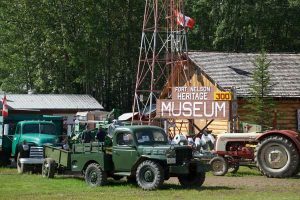 Fort Nelson Heritage Museum (pictured at left), adjacent Triple G campground, has Alaska Highway history and pioneer artifacts, a very fun stop. DC 284.7 Junction with south end of Old Alaska Highway and access to Al’s Car Clean & Repair; phone 250-774-4931. DC 301 Junction with Liard Highway to Fort Liard and Northwest Territories via Deh Cho Route. DC 344.7 Turnoff for Tetsa River Campground Regional Park. DC 357.5 Historical Mile 375. Tetsa River Services and Campground; gas/diesel, campground, popular cinnamon bun stop, rustic cabins, horse boarding. DC 373.3 Historic Milepost 392, Summit Lake; no services. The Summit Lake Lodge has been closed for many years. DC 373.6 Summit Pass (elev. 4,250 feet/1,295m), highest summit on the Alaska Highway. Summit Lake (Stone Mountain) Provincial Campground. Watch for Stone sheep on the highway. DC 404.6 Historical Mile 422, TOAD RIVER. Toad River Lodge; food, gas, diesel, lodging, camping. Toad River Lodge is the home of the world famous hat collection. DC 436.5 Entering MUNCHO LAKE (pop. 29) northbound. Double G Services; lodging, restaurant and gas. Muncho Lake, known for its beautiful deep green and blue waters, is 7 miles/11 km in length, and 1 mile/1.6 km in width; elevation is 2,680 feet/817m. DC 437.6 Strawberry Flats Campground, Muncho Lake Provincial Park; 15 sites on lakeshore. DC 442.2 Historical Mile 462. Northern Rockies Lodge; restaurant, gas, lodging, camping. Flightseeing trips of Northern Rockies and Virginia Falls in Nahanni National Park available. DC 442.9 MacDonald campground, Muncho Lake Provincial Park. DC 444.9 Muncho Lake viewpoint at Historic Milepost 463 (pictured at right). DC 477.1 Historical Mile 496. LIARD RIVER (unincorporated). 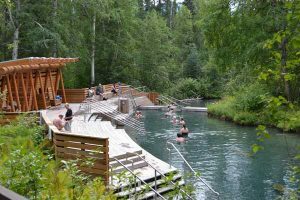 DC 477.7 Liard River Hotsprings Provincial Park; camping. A short walk leads to the hot springs pool (pictured at left). Not-to-be missed spot! DC 477.8 Historical Mile 497. Liard Hotsprings Lodge. DC 513.9 Historical Mile 533. COAL RIVER. Coal River Lodge & RV; food, gas, diesel, lodging and camping. Open May through September. DC 524.2 Historical Mile 543. FIRESIDE; no services. DC 567.9 Historic Milepost 588, Contact Creek, where crews worked from the south and the north met in September 1942, completing the southern sector of the Alaska Highway. DC 570 Historical Mile 590. CONTACT CREEK. Contact Creek Lodge, phone 867-536-2262 or email; coffee shop, snacks, gas, diesel, car repair, towing. Open year-round. DC 603.3 Welcome to British Columbia (southbound sign) at BC–YT border. DC 607 Lucky Lake (picnicking and swimming) and Liard Canyon Recreation Area (hiking trail). DC 610.5 Historical Mile 632.5. AFD gas/diesel station. DC 612.9 Historic Milepost 635, WATSON LAKE (pop. 1,563); all services. Visitor information. Lodging at Air Force Lodge, Big Horn Hotel, Cedar Lodge Motel. Camping at Downtown RV Park. Dining at Kathy’s Kitchen. Attractions: Watson Lake Signpost Forest (pictured at left), Northern Lights Centre. Junction of the Alaska Highway and the Campbell Highway. DC 615.3 Watson Lake Yukon government campground and day-use area 3 miles north. DC 626.2 Historical Mile 649, junction with the Cassiar Highway, which leads 450 miles/723 km south to the Yellowhead Highway 16; gas, diesel, convenience store, camping at junction. DC 627 Historical Mile 650. Nugget City; restaurant; gift shop with Canadian souvenirs; gas/diesel; lodging in cabins and budget sleeping rooms; RV park with hookups, laundromat, RV wash, showers/restrooms. DC 651.2 Big Creek Yukon government campground. DC 687.2 Historic Milepost 710.Rancheria Lodge; food, gas, lodging, camping. DC 695.2 Rancheria Falls Recreation Site; 10-minute walk to falls. DC 699.4 Turnout at Continental Divide. DC 709.8 Historic Milepost 733, SWIFT RIVER. No services. DC 719.6 Swan Lake Rest Area. DC 752 Morley River Recreation Site; day-use area. DC 775.5 Viewpoint (pictured below) overlooks Nisutlin Bay Bridge at Teslin. DC 776 Nisutlin Bay Bridge, longest water span on the Alaska Highway. DC 776.5 TESLIN (pop. 450) at Historical Mile 804; food, gas, lodging, camping. 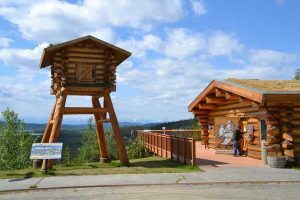 Attractions: George Johnston Museum and Teslin Tlingit Heritage Centre (see next 2 mileposts). DC 776.7 George Johnston Museum features more than a thousand artifacts reflecting the Tlingit heritage of the area; open June–Sept. DC 779.1 Teslin Tlingit Heritage Centre highlights inland Tlingit history, open daily June-September. DC 785.2 Teslin Lake Yukon government campground. DC 808.2 Junction with Canol Road; rest area. This is the South Canol Road which leads 137 miles/220 km to junction with Campbell Highway near Ross River. The North Canol Road leads from Ross River to the NWT border. Not recommended for tourist travel. DC 808.6 Teslin River Bridge, third longest water span on the highway. DC 808.9 Historic Milepost 836, JOHNSON’S CROSSING. Johnson’s Crossing Lodge and RV Park; home-cooked food, baked goods, motel, RV park, WiFi, gas, diesel, gift shop. DC 821 Squanga Lake Yukon government campground. DC 836.8 JAKE’S CORNER; gas/diesel. Junction with Tagish Road which leads 13.4 miles west to TAGISH (pop. 206) on the Tagish/Six Mile River. 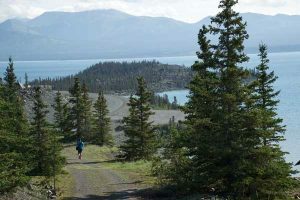 Also access to Atlin Road (1 mile south of Jake’s Corner), which leads south 58 miles to scenic ATLIN (pop. 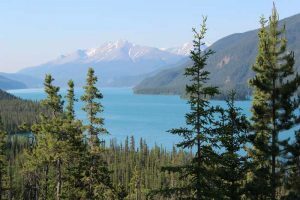 350) on Atlin Lake in British Columbia; lodging at Brewery Bay Chalet. DC 859.9 Historical Mile 890. Marsh Lake Yukon government campground. DC 867.3 Historic Milepost 897. 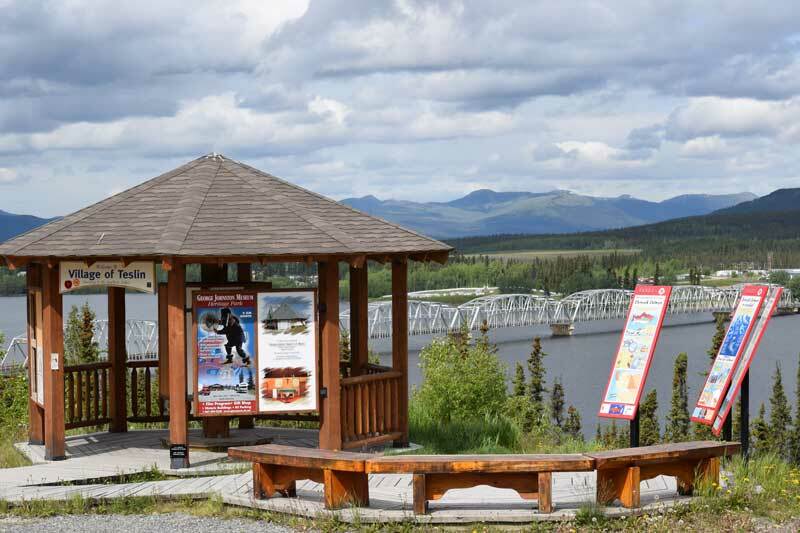 Yukon River Bridge and Marsh Lake Dam Rest Area. DC 873.5 Historical Mile 904. The Caribou RV Park and Wolf’s Den Restaurant; food, camping, hookups, laundromat. DC 874.4 Historical Mile 905. Junction with South Klondike Highway to Skagway, AK. DC 876.8 Historical Mile 906. Wolf Creek Yukon Government campground. DC 880 Historical Mile 910.5. Fireweed RV Services; RV repairs, parts, accessories, phone 867-668-5082. DC 880.8 Historic Milepost 911. Pioneer R.V. Park; camping, hookups, store, gas, diesel, propane. DC 881.7 Turnoff for scenic Miles Canyon (pictured at left) via Schwatka Lake Road. DC 882.7 Philmar RV Service & Supply Centre; RV parts and repairs; phone 867-668-6129. DC 883.5 City of Whitehorse rest area. DC 885.7 Historical Mile 915. Attraction: Yukon Beringia Interpretive Centre. DC 885.8 Lodging and restaurant at signed entrance for Whitehorse Airport. 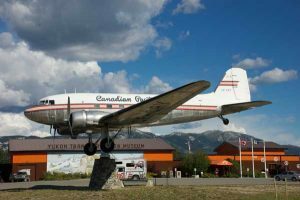 Attraction: Yukon Transportation Museum and Douglas DC-3 weathervane (pictured at right), a Whitehorse landmark. DC 887.4 Two Mile Hill exit to WHITEHORSE, capital of Yukon; all services and many attractions. Visitor information. DC 888.3 Gas station, restaurant. DC 888.7 Copperbelt Mining and Railway Museum. DC 890.8 Gas, grocery store. DC 891.1 Gas, convenience store, lodging. DC 891.4 Motel, gas, convenience store. DC 894.5 Junction with Klondike Highway 2, the Klondike Loop route to Dawson City and on to Alaska via Top of the World Highway, returning to Alaska Highway east of Tok via the Taylor Highway. Four miles north of this junction, turn on Takhini Hot Springs Road for Takhini Hot Springs, Hot Springs Campground and Hostel and Yukon Wildlife Preserve. DC 905.4 Historica Milepost 937. Viewpoint with litter bins. DC 926 Takhini Burn rest area; litter bin,s outhouses, viewing platform. DC 927.3 Historic Milepost 960. Turnoff to south for beautiful Kusawa Lake, a winding dirt and gravel road. 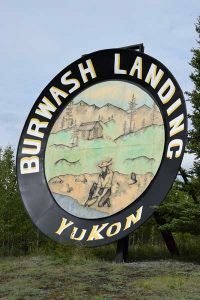 Access to Mendenhall Landing point of interest (Mile 1.4); Takhini River Yukon government campground (Mile 9); and Kusawa Lake Yukon government campground (Mile 14.7). DC 964.7 Historic Milepost 995. Otter Falls Cutoff; restaurant, gas, cabins, gift shop, store, camping. Junction with Aishihik Road to Otter Falls Viewpoint (17.4 miles) and Aishihik Lake campground (26.1 miles). DC 937.2 Turnoff for First National Community of CHAMPAGNE (pop. 25). Rest area at Mile 0.2. The Long Ago Peoples Place, a cultural heritage site, at Mile 5 on this side road. DC 965.6 Historic Canyon Creek Bridge (pictured at right); rest area with toilets and interpretive signs. DC 980.8 Yukon government Pine Lake Recreation Park; camping. DC 982.2 Haines Junction airport. DC 984.7 Fas Gas & RV Park, gas station (open year-round) with diesel, adjacent The Little Green Apple grocery store, and a summer-only RV park. Across the street is the Da Ku Cultural Centre, home to First Nations Cultural Centre and Visitor Information Centre for Yukon and Kluane National Park; visitor information, restrooms, open daily May–Sept., 8am–8pm. DC 985 Junction with Haines Highway to Haines, AK, at HAINES JUNCTION (pop. 824), Historic Milepost 1016; food at Village Bakery and the deli at Little Green Apple grocery; lodging in town at Parkside Inn, Wanderer’s Inn; gas and grocery store at Fas Gas and Little Green Apple; gas and convenience store at Top Spot/North 60˚ Petro Express. Visitor information. 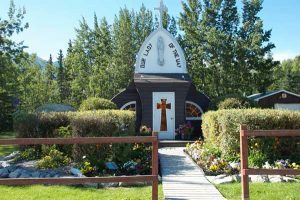 Attractions include Our Lady of the Way Catholic Mission (1954) pictured at left; the Village Monument; and St. Christopher’s Anglican Church, which hosts the Art & Crafts Guild of Haines Junction (local art, handmade crafts for sale). DC 985.3 Campground and gas station. DC 985.9 Gas station and motel. DC 999 Spruce Beetle Trail Interpretive Site. DC 1000.1 Bear Creek Summit (elev. 3,294 feet), highest point on the Alaska Highway between Whitehorse and Fairbanks. DC 1003.5 Historic Milepost 1035; Jarvis River bridge; turnout to river to west, good picnic spot. DC 1020 Kluane Lake Viewpoint. DC 1024 Large gravel turnout on Kluane Lake. Kluane Lake is the largest lake in Yukon. DC 1028.8 Tachal Dhal (Sheep Mountain) Visitor Centre; interpretive programs, viewing telescopes. Primary winter and spring range and lambing area for Dall sheep. DC 1029.7 Soldier’s Summit, Historic Milepost 1061. Trailhead parking for short hike up to the summit (trail pictured below right). DC 1029.8 Viewpoint overlooking Kluane Lake’s Horseshoe Bay. DC 1034.5 Historical Mile 1067. Cottonwood RV Park and Campground. DC 1039.3 Historical Mile 1072. Congdon Creek Yukon government campground. DC 1050.8 Historic Milepost 1083, DESTRUCTION BAY (pop. 55); good stop for food, gas, diesel, lodging, camping at Talbot Arm Motel, open year-round; phone 867-841-4461 or email. DC 1061 Historic Milepost 1093 BURWASH LANDING (pop. 84); gas. 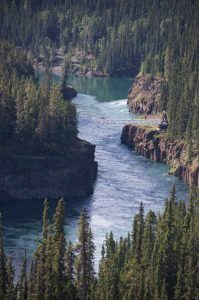 Attractions here include Kluane Museum of Natural History. The World’s Largest Goldpan—seen at left—is in the museum parking lot; good photo op. Kluane National Park glacier flights are available here from Rocking Star Adventures. DC 1112 Historical Mile 1147. Pine Valley Creperie, bakery, cabin/hostel and campground; phone 867-862-7047. Open daily May through September. DC 1117.1 Historical Mile 1152. Lake Creek Yukon government campground. DC 1123.9 Pickhandle Lake Rest Area. DC 1133.5 Discovery Yukon Lodgings and RV Park. DC 1153.4 Historical Mile 1188. Snag Junction Yukon government campground. DC 1166.5 Historic Milepost 1202, BEAVER CREEK (pop. 112); Visitor Information Centre open daily in summer, phone 867-862-7321. Traveler services include restaurant, cabins, campground, showers and laundromat at Buckshot Betty’s (open year-round); fuel, gift shop, RV park and motel at Beaver Creek RV Park & Motel; gas and lodging at 1202 Motor Inn. DC 1168.5 Canadian Customs Beaver Creek station, open 24 hours a day year-round. All traffic entering Yukon must stop. DC 1186.3 Historic Milepost 1221. Canada–U.S. International Border; rest area and photo-op. Welcome to Alaska sign northbound. The MILEPOST® Log now adds physical mileposts (MP) to log in Alaska. DC 1186.8 MP 1221.8 U.S. Customs and Border Protection station Port Alcan, open 24 hours a day year-round. All traffic entering Alaska must stop. DC 1194 MP 1229 Tetlin National Wildlife Refuge Visitor Center (pictured at left) is open mid-May to mid-September; restrooms, interpretive programs, viewing telescopes, wildlife exhibits. DC 1199.5 MP 1234.5 Seaton Roadhouse Interpretive Site and Trails (Tetlin NWR). DC 1214.3 MP 1249.3 Historic Milepost 1254. Deadman Lake (Tetlin NWR) Campground. DC 1221.7 MP 1256.7 Lakeview (Tetlin NWR) Campground. DC 1229 MP 1264 Northway Junction; campground, gas, store. NORTHWAY (pop. 136) is accessed via Northway Road; airport is 6.5 miles south of this junction and the Native Village of Northway is 2 miles beyond the airport. Northway is considered a gateway to Alaska for small aircraft following the Alaska Highway because they must clear customs here unless they have enough fuel to reach Fairbanks or Anchorage. DC 1266.7 MP 1301.7 Historic Milepost 1306 Tetlin Junction. Junction with the Taylor Highway, which leads to Eagle (160 miles), and to Top of the World Highway to Dawson City, YT (175 miles); see Klondike Loop. DC 1268 MP 1303 Turnoff to south for short access road to Tanana River Bridge viewpoint and rest area. DC 1268.6 MP 1303.6 Crossing Tanana River Bridge. Rest area to north at west end of bridge. DC 1278.1 MP 1313.1 Fast Eddy’s Frontier Cabins, phone 907-883-4411. DC 1278.2 MP K1313.3 Young’s Motel and Fast Eddy’s Restaurant. DC 1278.4 MP 1313.4 Tok RV Village camping. DC 1279.2 MP 1314.2 Junction of Alaska Highway and Tok Cutoff at TOK (pop. 1,435); All Alaska Gifts, Tok Memorial Park and Tok Mainstreet Visitors Center. Visitor Information at Tok Mainstreet Visitors Center and at the Alaska Public Lands Information Center. 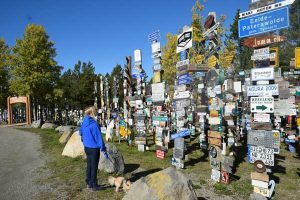 Tok is a major overland point of entry to Alaska, especially for summer travelers coming up the Alaska Highway. Food at Fast Eddy’s Restaurant; lodging at Fast Eddy’s Frontier Cabins, Young’s Motel , Burnt Paw Cabins Outback and Cleft of the Rock Bed & Breakfast. 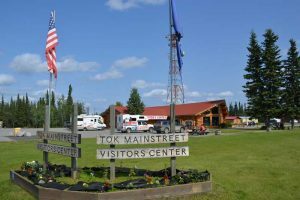 Camping at Tok RV Village (in town); Sourdough Campground (just west of Tok on the Tok Cutoff); Tundra Lodge and RV Park (northwest of town), phone 907-883-7875 or email. Shop for gifts and souvenirs in Tok at All Alaska Gifts, Burnt Paw Gift Shop and Mukluk Land. DC 1279.3 MP 1314.3 Burnt Paw Gifts and Cabins Outback. DC 1280 MP 1315 Tundra Lodge and RV Park (email) with spacious forested campsites. DC 1282 MP 1317 Mukluk Land; museum, entertainment center, mini-golf. DC 1296.9 MP 1331.9 Moon Lake State Recreation Site; camping. DC 1309.5 MP 1344.5 Rest area with view of Alaska Range and Tanana River, interpretive panel. DC 1312.5 Robertson River Bridge. DC 1326.3 MP 1361.3 DOT LAKE (pop. 13); post office. DC 1326.5 MP 1361.5 Historic Milepost 1358; turnout on shore of Dot Lake. Dot Lake Lakeside Community Chapel (built 1949). DC 1357.7 MP 1392.7 Gerstle River Black Veterans Memorial Bridge, 1 of 4 steel through truss-style bridge constructions on the Alaska Highway. DC 1369.1 MP 1404.1 Silver Fox Roadhouse; cabins, gift shop, wildlife display, gas/diesel. DC 1378.4 MP 1413.4 Delta Meat & Sausage Co.; free samples of buffalo and reindeer sausage. DC 1379.8 MP 1414.8 Turnoff for Clearwater State Recreation Site campground. DC 1385.9 MP 1420.9 Snowed Inn RV Park, phone 907-895-4270; full-hookups, tent sites, laundry. DC 1387 MP 1422 Junction of the Alaska and Richardson highways at DELTA JUNCTION (pop. 984), all services. Visitor information is at the junction of the Alaska and Richardson highways. Delta Junction is the official end of the Alaska Highway; the Richardson Highway from Valdez continues 96 miles to Fairbanks. Gas, diesel and propane available. Dining and lodging at Alaskan Steakhouse and Motel; lodging at Kelly’s Alaska Country Inn. Camping at Snowed Inn RV Park. Other services in town include The Calico Cow Quilt Shop; Buffalo Center Drive-In , an old-fashioned drive-in with “the best burgers, fries and shakes this side of the Yukon”; and Delta Meat and Sausage Co., stop by for samples. 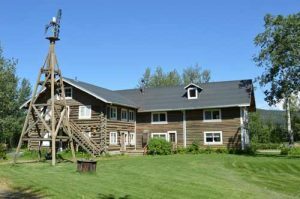 Area lodging and attractions: The Lodge at Black Rapids, Silver Fox Roadhouse and Rika’s Roadhouseat Big Delta Historical Park. The MILEPOST® Log continues to Fairbanks via the Richardson Highway (also designated Route 2 between Delta Junction and Fairbanks), with physical mileposts (V) indicating distance from Valdez. DC 1388 V 267 Delta State Recreation Site campground. DC 1396 V 275 Turnoff for Big Delta State Historical Park; historic Rika’s Roadhouse (pictured below right), cabin rentals, museum, overnight RV parking spaces in parking lot; phone 623-696-5919; open May 15 to Labor Day. DC 1396.4 V 275.4 Tanana River/Pipeline Crossing. DC 1398.7 V 277.7 Quartz Lake State Recreation Area; camping. DC 1414.5 V 293.5 Tenderfoot Pottery. DC 1426.2 V 305.2 Birch Lake State Recreation Site; camping. DC 1442.5 V 321.5 Harding Lake State Recreation Area; camping. DC 1443.2 V 322.2 SALCHA (pop. 953): food, propane, lodging. DC 1444.1 V 323.1 Salcha River State Recreation Site; camping. DC 1449.3 V 328.3 Salcha store and gas. DC 1453.3 V 332.3 The Knotty Shop phone 907-488-3014 or email; gifts, wildlife display, ice cream, burl artwork. Open all year. DC 1462.3 V 341.3 EIELSON AIR FORCE BASE (pop. 2,867). DC 1467.6 V 346.6 Chena Lakes Recreation Area; camping, fishing, swimming and access to Moose Creek Dam Bikeway. DC 1468.4 V 347.4 Exit westbound only for Dawson-Buzby Roads (Santa Claus House and North Pole Visitor Information Cabin). DC 1469 V 348 Exit eastbound only for Dawson-Buzby Roads (Santa Claus House and North Pole Visitor Information Cabin). DC 1469.5 V 348.5 Exit westbound only north to Mission Road, then quick right onto Mistletoe Drive to North Pole Visitor Information Cabin. Also access this exit to KJNP Radio (drive straight ahead from exit then turn left on narrow road by big church). DC 1470 V 349 NORTH POLE (pop. 2,138); all services. North Pole Visitor Information Cabin. Attractions: Santa Claus House, KJNP radio/TV sod-roofed complex. 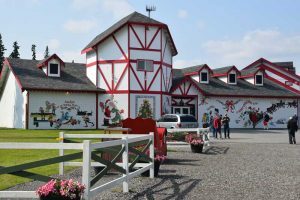 Lodging at Hotel North Pole. Meet reindeer up-close and personal at the Antler Academy. DC 1477.6 V 356.6 Turnoff on Badger (loop) Road for camping at Riverview RV Park. DC 1483 V 362 FAIRBANKS.